Revenue in the Other Juice, Juice Mixtures & Smoothies segment amounts to US$28,485.4m in 2019. The market is expected to grow annually by 4.5% (CAGR 2019-2023). In global comparison, most revenue is generated in Japan (US$3,635m in 2019). The average per capita consumption stands at 1.9 L in 2019. The Other Juices segment contains juices, and mixes of juices, with 100% fruit juice or vegetable juice content that are not already contained in the Orange Juice, Apple Juice, Grapefruit Juice, Grape Juice and Pineapple Juice segments. These juices can be directly pressed or from concentrate. Not included are fruit nectars or other drinks which do not have 100% fruit juice content. The market for Non-Alcoholic Drinks is structured into off-trade sales (in stores) and on-trade sales (in bars, restaurants etc.). Statista values off-trade sales at retail prices and on-trade sales at purchasing prices to the on-trade establishments. Additional markups for hospitality services are therefore not taken into account. Reading Support Revenue in the Other Juice, Juice Mixtures & Smoothies segment amounts to US$28,485.4m in 2019. Reading Support The Other Juice, Juice Mixtures & Smoothies segment is expected to show a revenue growth of 4.9% in 2020. Reading Support The average revenue per person in the market for Other Juice, Juice Mixtures & Smoothies amounts to US$3.87 in 2019. Reading Support In the market for Other Juice, Juice Mixtures & Smoothies, volume is expected to amount to 15,418.3 ML by 2023. 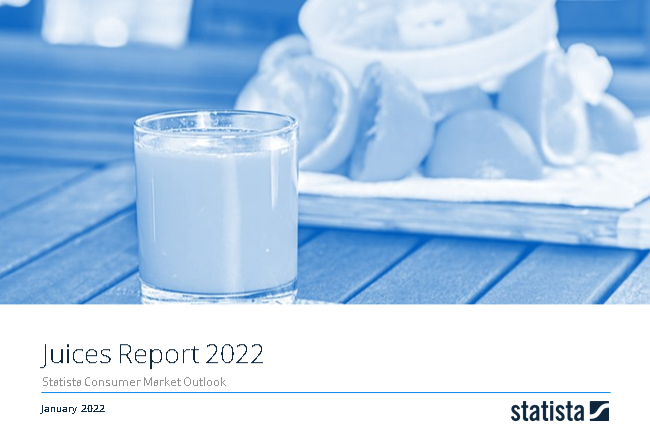 Reading Support The market for Other Juice, Juice Mixtures & Smoothies is expected to show a volume growth of 2.1% in 2020. Reading Support The average volume per person in the market for Other Juice, Juice Mixtures & Smoothies amounts to 1.9 L in 2019. Reading Support The average price per unit in the market for Other Juice, Juice Mixtures & Smoothies amounts to US$1.99 in 2019. Reading Support With a market volume of US$3,635m in 2019, most revenue is generated in Japan. Here you can find more studies and statistics about "Other Juice, Juice Mixtures & Smoothies".